On 23rd May the Telegraph published the results of an ORB poll which suggested that the traditional advantage of the Leave campaign among older voters was being eroded. The poll showed that 51% of over-65s were planning to vote Remain in the EU referendum, compared with 44% planning to vote Leave. The finding may well have contributed to Vote Leave’s decision to more aggressively focus on the consequences of EU migration to mobilise their ‘core vote’ in the run up to polling day. The finding is not only surprising for campaigners but to anyone who has closely watched the polls and looked at how support for either side breaks down by age. Indeed we wrote only a few weeks ago about the huge generational divide when it comes to attitudes about EU membership, in which the young are overwhelmingly pro-EU and generally optimistic about the UK’s relationship with it, and older voters are overwhelmingly hostile. So where did this sudden surge of support for EU membership among older voters come from, and how likely is it to persist until 23rd June? There are two points to consider. The first is that this is not, in fact, an out of the blue surge in support for EU membership – ORB’s polls have actually been showing a steady increase in support among the over 65s for weeks. 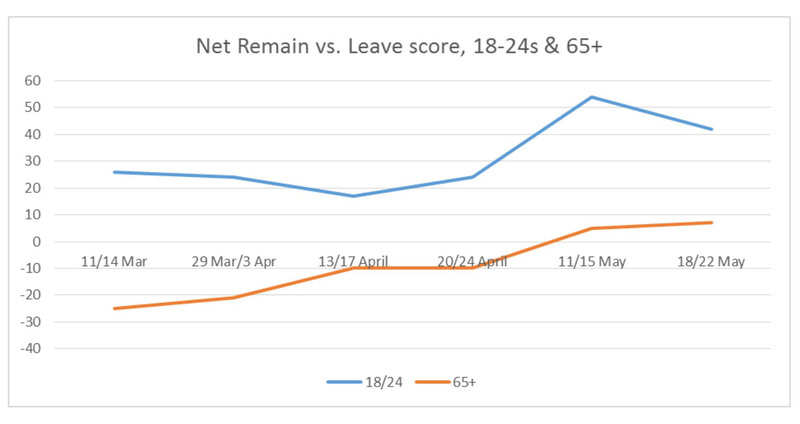 As the graph below illustrates, in early March the net remain vs. leave score for the 65+ was -25; by early April it was -10, by early May +5, and by last week +7. This has been accompanied by a similar increase among the under-25s over the past five weeks (which you can read more about here). 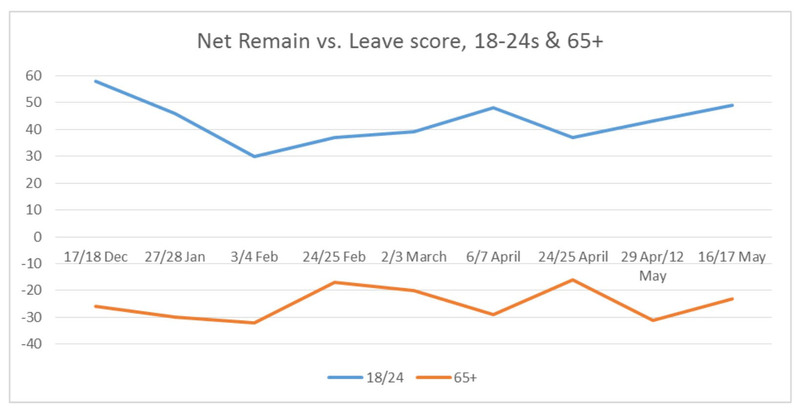 The data suggests that the Leave campaign should be even more worried than the Telegraph’s original article implied – the support for Remain among the over-65s is not a short lived spike, but the result of a gradual and consistent trend. Whether this reflects the success or failure of the of the Remain or Leave campaigns cannot yet be determined, but it is clear that the Leave campaign are in serious trouble if they are losing the support of those who have traditionally been the most likely to vote to leave the EU if given a chance. The second point to consider, however, is that this trend is not evident across all polling methods; it actually looks different depending on whether telephone or online polling is used. The graph below, for example, shows data from a similar period for the 18-24 and over-65 age groups from YouGov, who conduct their polls exclusively online. While there is evidence of a slight increase in support for EU membership among the youngest voters since early February, the trend of growing support among older voters is not apparent. Instead, their support seems to have fluctuated around the same level of between -20 and -30, suggesting that the over-65s continue to be hostile towards Britain’s membership of the EU and most will back Leave in June. 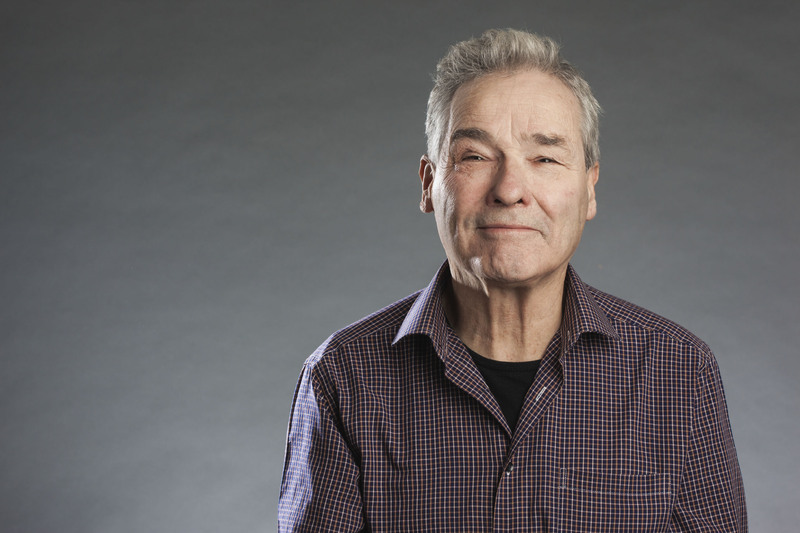 Furthermore, ORB themselves conducted some online polling at the end of April which put the net remain vs. leave score of the over-65s at -20, with 60% saying they would vote to leave the EU. Comparing this with previous online polls conducted by OBR shows a trend very similar to that in the YouGov data shown below, that the over-65s’ hostility to EU membership has remained relatively stable since last year. They had a net remain vs. leave score of -14 in December 2015, -28 in February 2016, and -20 in March, April and now May. Whether or not there actually is a trend of growing support for EU membership among older voters is heavily influenced, therefore, by the way the poll is conducted. This brings us to the issue of whether online or telephone polls are more reliable. Numerous assessments have been conducted, but until the referendum has actually taken place a definitive answer to the question will not be forthcoming. Populus (a primarily telephone polling company) and Number Crunch Politics have suggested that pollsters have typically failed to attract enough socially liberal voters to their samples and so are getting biased data. They argue that telephone polls are better placed to reach such voters and so are producing more accurate results. This would imply that the trend in the first graph is closer to the truth, and that Vote Leave are indeed in serious trouble. The online polling company YouGov, however, disagrees with this conclusion and argues that it is pollsters’ over-sampling of highly educated voters – who tend to be far more supportive of EU membership than their less well-educated counterparts – that is to blame. They claim that online polls are better suited to overcoming this problem, and so are typically more accurate. Ultimately we will not know which is the more reliable until after the referendum. What we can conclude is that campaigners should not jump unquestioningly on the ORB poll reported in the Telegraph and conclude that Vote Leave are losing the campaign. At the same time, they shouldn’t be complacent and dismiss the potential that the most Eurosceptic generation in the British electorate could be becoming more supportive of EU membership.